This is “The Challenges of Starting a Business”, chapter 5 from the book An Introduction to Business (v. 1.0). For details on it (including licensing), click here. One balmy San Diego evening in 1993, Mary and Rick Jurmain were watching a TV program about teenage pregnancy.This vignette is based on the following sources: Realityworks Inc., “About Us,” Realityworks, http://www.realityworks.com/aboutus.html (accessed October 4, 2008); Realityworks Inc., “RealCare Baby,” Realityworks (2008), http://www.realityworks.com/realcare/realcarebaby.html (accessed October 4, 2008); “Realityworks Infant Simulator and RealCare Parenting Program,” Horizons Solutions Site (August 17, 2007), http://www.solutions-site.org/artman/publish/article_47.shtml (accessed October 4, 2008); Brenda Bredahl, “Bringing Up Baby,” BNET.com, Corporate Report Wisconsin, January 2004, http://findarticles.com/p/articles/mi_qa5426/is_/ai_n21343525 (accessed October 7, 2008); “Have a Baby? I Think I’ll Think It Over,” Horizons Solutions Site (1998), http://www.solutions-site.org/kids/stories/KScat3_sol72.htm (accessed October 4, 2008); “‘Baby’ Helps Teens Think It Over!” Education World, May 25, 1998, http://www.education-world.com/a_curr/curr077.shtml (accessed October 6, 2008); Kate Stone Lombardi, “Doll Gives a Taste of Real Life,” New York Times, May 24, 1998, http://query.nytimes.com/gst/fullpage.html?res= 9B05E3DC1231F930A3575BC0A962958260 (accessed October 6, 2008); J. F. L., MD, “Dolls from Hell,” Pediatrics 97, no. 3 (March 1996), http://pediatrics.aapublications.org/cgi/content/abstract/97/3/317 (accessed October 6, 2008); Deborah L. Cohen, “Bringing Up Baby,” Education Week, November 16, 1994, http://www.edweek.org/ew/articles/1994/11/16/11baby.h14.html (accessed October 6, 2008); “This Doll Tells the Young to Hold Off,” New York Times, August 3, 1994, http://query.nytimes.com/gst/fullpage.html?res= 9B05E3DC1231F930A3575BC0A962958260 (accessed October 6, 2008). To simulate the challenge of caring for an infant, teens on the program were assigned to tend baby-size sacks of flour. Rick, a father of two young children, remarked that trundling around a sack of flour wasn’t exactly a true-to-life experience. In particular, he argued, sacks of flour simulated only abnormally happy babies—babies who didn’t cry, especially in the middle of the night. Half-seriously, Mary suggested that her husband—a between-jobs aerospace engineer—build a better baby, and within a couple of weeks, a prototype was born. Rick’s brainchild was a bouncing 6.5-pound bundle of vinyl-covered joy with an internal computer to simulate infant crying at realistic, random intervals. He also designed a drug-affected model to simulate tremors from withdrawal, and each model monitored itself for neglect or ill treatment. Mary and Rick discuss the origins of Realityworks Inc.
5.1 What Is an Entrepreneur? Describe the three characteristics of entrepreneurial activity. Identify five potential advantages to starting your own business. Explain the differences among three types of start-up firms. In developing BTIO and Realityworks Inc., the Jurmains were doing what entrepreneurs do (and doing it very well). In fact, Mary was nominated three times for the Ernst & Young Entrepreneur of the Year Award and named 2001 Wisconsin Entrepreneurial Woman of the Year by the National Association of Women Business Owners. So what, exactly, is an entrepreneur? What does an entrepreneur do? According to one definition, an entrepreneur is an “individual who starts a new business,” and that’s true as far as it goes. Another definition identifies an entrepreneur as someone who uses “resources to implement innovative ideas for new, thoughtfully planned ventures”Canadian Foundation for Economic Education, “Glossary of Terms,” Mentors, Ventures & Plans (2008), http://www.mvp.cfee.org/en/glossary.html (accessed October 7, 2008). which is also true as far as it goes. But an important component of a satisfactory definition is still missing. To appreciate fully what it is, let’s go back to the story of the Jurmains, for whom entrepreneurship seems to have worked out quite well. We hasten to point out that, in 1993, the Jurmains were both unemployed—Rick had been laid off by General Dynamics Corp., and Mary by the San Diego Gas and Electric Company. While they were watching the show about teenagers and flour sacks, they were living off a loan from her father and the returns from a timely investment in coffee futures. Rick recalls that the idea for a method of creating BTIO came to him while “I was awake in bed, worrying about being unemployed.” He was struggling to find a way to feed his family. He had to make the first forty simulators himself, and at the end of the first summer, BTIO had received about four hundred orders—a promising start, perhaps, but, at $250 per baby (less expenses), not exactly a windfall. “We were always about one month away from bankruptcy,” recalls Mary. At the same time, it’s not as if the Jurmains started up BTIO simply because they had no “conventional” options for improving their financial prospects. Rick, as we’ve seen, was an aerospace engineer, and his résumé includes work on space-shuttle missions at NASA. Mary, who has not only a head for business but also a degree in industrial engineering, has worked at the Johnson Space Center. Therefore, the idea of replacing a sack of flour with a computer-controlled simulator wasn’t necessarily rocket science for the couple. But taking advantage of that idea—choosing to start a new business and to commit themselves to running it—was a risk. Risk taking is the missing component that we’re looking for in a definition of entrepreneurship, and so we’ll define an entrepreneurIndividual who identifies a business opportunity and assumes the risk of creating and running a business to take advantage of it. as someone who identifies a business opportunity and assumes the risk of creating and running a business to take advantage of it. If we look a little more closely at the definition of entrepreneurship, we can identify three characteristics of entrepreneurial activity:Adapted from Marc J. Dollinger, Entrepreneurship: Strategies and Resources, 3rd ed. (Upper Saddle River, NJ: Prentice Hall, 2003), 5–7. Innovation. Entrepreneurship generally means offering a new product, applying a new technique or technology, opening a new market, or developing a new form of organization for the purpose of producing or enhancing a product. Running a business. A business, as we saw in Chapter 1 "The Foundations of Business", combines resources to produce goods or services. Entrepreneurship means setting up a business to make a profit. Risk taking. The term risk means that the outcome of the entrepreneurial venture can’t be known. Entrepreneurs, therefore, are always working under a certain degree of uncertainty, and they can’t know the outcomes of many of the decisions that they have to make. Consequently, many of the steps they take are motivated mainly by their confidence in the innovation and in their understanding of the business environment in which they’re operating. It isn’t hard to recognize all three of these characteristics in the entrepreneurial experience of the Jurmains. They certainly had an innovative idea. But was it a good business idea? In a practical sense, a “good” business idea has to become something more than just an idea. If, like the Jurmains, you’re interested in generating income from your idea, you’ll probably need to turn it into a product—something that you can market because it satisfies a need. If—again, like the Jurmains—you want to develop a product, you’ll need some kind of organization to coordinate the resources necessary to make it a reality (in other words, a business). Risk enters the equation when, like the Jurmains, you make the decision to start up a business and when you commit yourself to managing it. 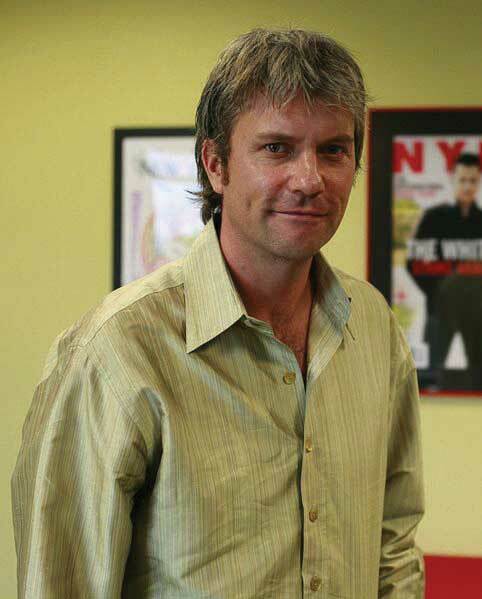 Do you think Chris DeWolfe knew what a huge success MySpace would be when he and Tom Anderson started their Web site? Source: http://commons.wikimedia.org/wiki/File:Chris_DeWolfe.jpg accessed Feb. 2, 2009. So what about you? Do you ever wonder what it would be like to start your own business? Maybe you want to try your hand at entrepreneurship. You could be the next Tom Anderson or Chris DeWolfe, founders of MySpace. Or the next David Marcks, a golf course manager who came up with the idea of Geese Police—training dogs to chase geese from golf courses, corporate parks, and municipal playgrounds.Isabel M. Isidro, “Geese Police: A Real-Life Home Business Success Story,” PowerHomeBiz.com (2008), http://www.powerhomebiz.com/OnlineSuccess/geesepolice.htm (accessed October 8, 2008). Or even the next Pierre Omidyar, the French-born software developer who built an online venue for person-to-person auctions, known as eBay.See American Academy of Achievement, “Pierre Omidyar,” Academy of Achievement (November 9, 2005), http://www.achievement.org/autodoc/page/omi0bio-1 (accessed October 8, 2008). You might even turn into a “serial entrepreneur,” like Dan Bricklin, whose résumé so far includes four software companies: Software Arts (founded to market his own invention, an electronic spreadsheet calculator), Software Garden (software for monitoring Web servers), Slate Corp. (software for pen computers), and Trellix Corp. (software for building and hosting Web sites).Dan Bricklin, Dan Bricklin’s Web site, http://www.bricklin.com (accessed October 8, 2008); Dan Bricklin, “Natural-Born Entrepreneur—Lessons of a Serial Entrepreneur,” Working Knowledge (October 22, 2001), http://hbswk.hbs.edu/archive/2569.html (accessed October 8, 2008). Should I build a business from scratch, buy an existing business, or invest in a franchise? How do I go about planning a business? What steps are involved in developing a business plan? Where would I find help in getting my business started and operating it through the start-up phase? How can I increase the likelihood that I’ll succeed? In this chapter, we’ll provide some answers to questions like these. Let’s say that you are interested in the idea of going into business for yourself. Not everyone, of course, has a desire to take the risks and put in the work involved in starting up a business. What sort of characteristics distinguishes those who do from those who don’t want to start a business? Or, more to the point, why do some people actually follow through on the desire to start up their own businesses? According to the Small Business Administration (SBA)Government agency that helps prospective owners set up small businesses, obtain financing, and manage ongoing operations., a government agency that provides assistance to small businesses, the most common reasons for starting a business are the following:U.S. Small Business Administration, “First Steps: How to Start a Small Business,” http://www.sba.gov/starting/indexsteps.html (accessed April 21, 2006). The SBA points out, though, that these are likely to be advantages only “for the right person.” And how do you know if you’re one of the “right people”? The SBA suggests that you assess your strengths and weaknesses by asking yourself a few relevant questions:U.S. Small Business Administration, “Is Entrepreneurship for You?” http://www.sba.gov/smallbusinessplanner/plan/getready/SERV_SBPLANNER_ISENTFORU.html (accessed October 26, 2008). Am I a self-starter? You’ll need to develop and follow through on your ideas. You’ll need to be able to organize your time. How well do I get along with different personalities? You’ll need to develop working relationships with a variety of people, including unreliable vendors and sometimes cranky customers. How good am I at making decisions? You’ll be making decisions constantly—often under pressure. Do I have the physical and emotional stamina? Can you handle six or seven workdays of as long as twelve hours every week? How well do I plan and organize? If you can’t stay organized, you’ll get swamped by the details. In fact, poor planning is the culprit in most business failures. Is my drive strong enough? You’ll need to be highly motivated to withstand bad periods in your business, and simply being responsible for your business’s success can cause you to burn out. How will my business affect my family? Family members need to know what to expect before you begin a business venture, such as financial difficulties and a more modest standard of living. Later in this chapter, we’ll take up the question of why businesses fail, but since we’re still talking about the pros and cons of starting a business in the first place, we should consider one more issue: in addition to the number of businesses that start and then fail, a huge number of business ideas never even make it to the grand opening. One business analyst cites four reservations (or fears) that prevent people from starting businesses:Shari Waters, “Top Four Reasons People Don’t Start a Business,” About.com, http://retail.about.com/od/startingaretailbusiness/tp/overcome_fears.htm (accessed October 8, 2008). Money. Granted, without the cash, you can’t get very far. What to do: Conduct some research to find out where funding is available. Security. A lot of people don’t want to sacrifice the steady income that comes with the nine-to-five job. What to do: Don’t give up your day job. At least at first, think about hiring someone to run your business while you’re gainfully employed elsewhere. Competition. A lot of people don’t know how to distinguish their business ideas from similar ideas. What to do: Figure out how to do something cheaper, faster, or better. Lack of ideas. Some people simply don’t know what sort of business they want to get into. What to do: Find out what trends are successful. Turn a hobby into a business. Think about a franchise. If you’re still interested in going into business for yourself, feel free to regard these potential drawbacks as mere obstacles to be overcome by a combination of planning and creative thinking. These bakers are not entrepreneurs. They run their small bakery for the sole purpose of providing an income for themselves and their families (a salary-substitute firm) or to earn a living while pursuing their hobby of baking (a lifestyle firm). Though most entrepreneurial ventures begin as small businesses, not all small business owners are entrepreneurs. Generally speaking, we can divide small businesses into three types:Adapted from Bruce R. Barringer and R. Duane Ireland, Entrepreneurship: Successfully Launching New Ventures, 2nd ed. (Upper Saddle River, NJ: Pearson Education, 2008), 16. Salary-substitute firms are started to provide owners with incomes similar to those that they’d be earning while working for an employer. Typically, they offer common products—retail merchandise, for example, or a service like accounting or hairstyling. Most small businesses are of this type. As the name suggests, people start lifestyle firms to earn a living while pursuing a particular lifestyle. These businesses often reflect owners’ hobbies or favorite pursuits—say, surf shops or rock-climbing excursions. As a rule, they don’t do anything innovative, and they don’t need to grow very fast. Like BTIO, entrepreneurial firms bring innovative products to market. Like the Jurmains, owners are people who recognized an opportunity and developed a product to satisfy the needs of certain customers. Their goal is to grow the business and eventually expand into other markets. An entrepreneur is someone who identifies a business opportunity and assumes the risk of creating and running a business to take advantage of it. Innovating. An entrepreneur offers a new product, applies a new technique or technology, opens a new market, or develops a new form of organization for the purpose of producing or enhancing a product. Running a business. Entrepreneurship means setting up a business to make a profit from an innovative product or process. Risk taking. Risk means that an outcome is unknown. Entrepreneurs, therefore, are always working under a certain degree of uncertainty, and they can’t know the outcomes of many of the decisions that they have to make. Use your skills and knowledge. How well do I get along with different personalities? Do I have the physical and emotional stamina? Is my drive strong enough? How will my business affect my family? Salary-substitute firms are started to provide owners with incomes similar to those that they’d be earning while working for employers. People start lifestyle firms to earn a living while pursuing a particular lifestyle; they often reflect owners’ hobbies or favorite pursuits. Entrepreneurial firms bring innovative products to market; owners are people who recognized an opportunity and developed a product to satisfy the needs of certain customers. They are creative people who sometimes accomplish extraordinary things because they’re passionate about what they’re doing. They are risk-taking optimists who commit themselves to working long hours to reach desired goals. They take pride in what they’re doing and get satisfaction from doing something they enjoy. They have the flexibility to adjust to changing situations to achieve their goals. We’ll also add that entrepreneurs usually start small. They begin with limited resources and build their businesses through personal effort. At the end of the day, their success depends on their ability to manage and grow the organization that they created to implement their vision. It doesn’t sound like me. It sounds like me to a certain extent. It sounds a lot like me. Based on your responses, do you think that you have the attributes of an entrepreneur? Do you think you could be a successful entrepreneur? Why, or why not? Explain the importance of small businesses to the U.S. economy. Explain why small businesses tend to foster innovation more effectively than large ones. Describe some of the ways in which small companies work with big ones. To assess the value of small businesses to the U.S. economy, we first need to know what constitutes a small business. Let’s start by looking at the criteria used by the Small Business Administration. According to the SBA, a small businessAccording to the SBA, a business that is independently operated, exerts little influence in its industry, and employs fewer than five hundred people. is one that is independently owned and operated, exerts little influence in its industry, and (with a few exceptions) has fewer than five hundred employees.U.S. Small Business Administration, “What Is Small Business?” (2008), http://www.sba.gov/services/contractingopportunities/sizestandardstopics/size/index.html (accessed October 9, 2008). 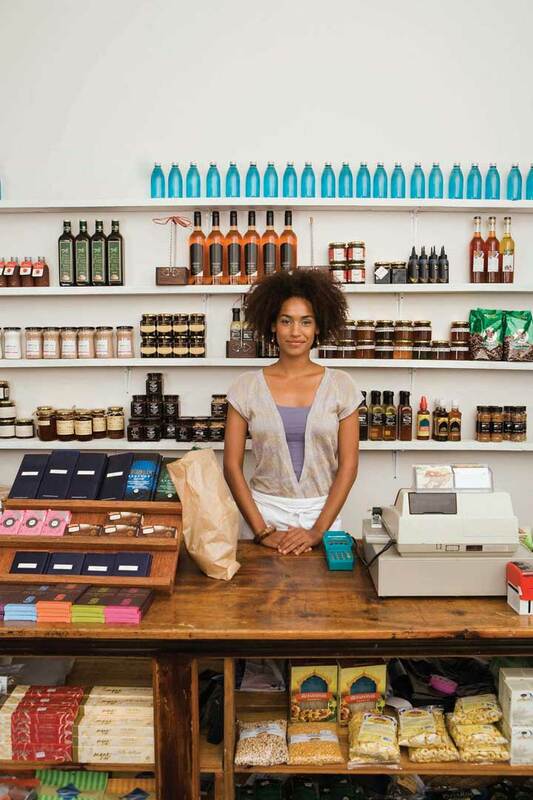 Small business constitutes a major force in the U.S. economy. There are nearly twenty-seven million small businesses in this country, and they generate about 50 percent of our gross domestic product (GDP).Office of Advocacy, U.S. Small Business Administration, The Small Business Economy for Data Year 2006: A Report to the President (December 2007), http://www.sba.gov/advo/research/sb_econ2007.pdf (accessed October 9, 2008). Indeed, if all the small businesses in the United States seceded and formed their own economy, it would be the third-largest economy in the world (behind the United States itself and China).Thomas W. Zimmerer and Norman M. Scarborough, Essentials of Entrepreneurship and Small Business Management, 5th ed. (Upper Saddle River, NJ: Pearson Education, 2008), 27. The millions of individuals who have started businesses in the United States have shaped the business world as we know it today. Some small business founders like Henry Ford and Thomas Edison have even gained places in history. Others, including Bill Gates (Microsoft), Sam Walton (Wal-Mart), Steve Jobs (Apple Computer), Michael Dell (Dell, Inc.), Steve Case (AOL), Pierre Omidyar (eBay), and Larry Page and Sergey Brin (Google), have changed the way business is done today. Still millions of others have collectively contributed to our standard of living. In addition, they complement the economic activity of large organizations by providing them with components, services, and distribution of their products. Let’s take a closer look at each of these contributions. The majority of Americans first entered the business world by working for small businesses, and today, more than half of all U.S. adults either are self-employed or work for businesses with fewer than five hundred employees.Terry Bibbens, “A New View of Government, University, and Industry Partnerships” (U.S. Small Business Administration, Office of Advocacy, February 2000), 2, http://www.sba.gov/advo/laws/test99_0804.pdf (accessed October 10, 2008). These enterprises are constantly creating jobs and providing opportunities for a vast number of workers. Figure 5.3 "Net New Jobs by Firm Size, 1992–1996" shows just how many jobs were created by small (and very small) firms between 1992 and 1996, the last year for which there are data on the actual number of jobs created by small firms. In the decade between 1995 and 2005, small businesses also created 60 percent to 80 percent of net new jobs annually, including 40 percent of high-tech workers (scientists, engineers, computer workers). 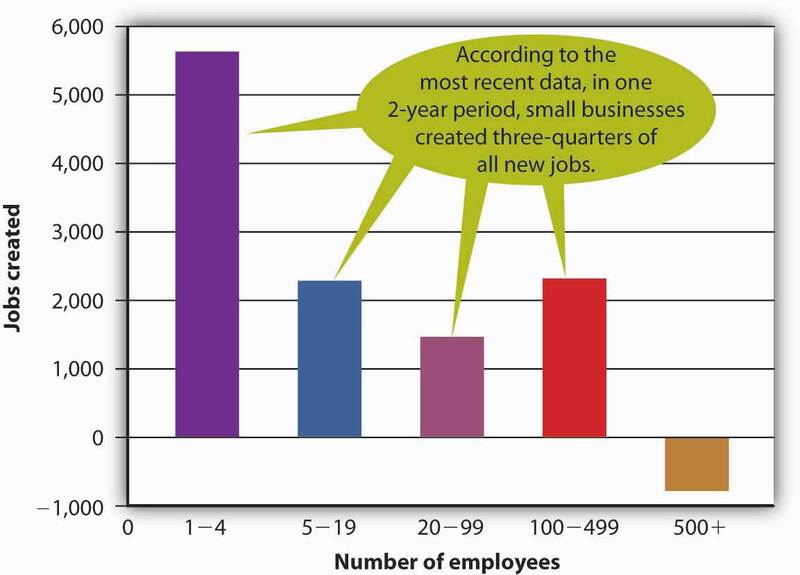 Their share of total employment remains steady at about 51 percent, because many small firms, as they add employees, naturally grow into large firms.Terry Bibbens, “A New View of Government, University, and Industry Partnerships” (U.S. Small Business Administration, Office of Advocacy, February 2000), 2, http://www.sba.gov/advo/laws/test99_0804.pdf (accessed October 10, 2008), 3. Given the financial resources available to large businesses, you’d expect them to introduce virtually all the new products that hit the market. According to the SBA, however, 40 percent of all U.S. corporate patents come from small businesses, self-employed inventors, and inventors working for small companies.CHI Research Inc., “Small Serial Innovators: The Small Firm Contribution to Technical Change” (U.S. Small Business Administration, Office of Advocacy, March 2003), 11, http://www.sba.gov/advo/research/rs225tot.pdf (accessed October 10, 2008). Over the years, the list of important innovations by small firms has included the airplane and air-conditioning, the defibrillator and DNA fingerprinting, oral contraceptives and overnight national delivery, the safety razor, strobe lights, and the zipper.William J. Baumol, “Small Firms: Why Market-Driven Innovation Can’t Get Along without Them” (U.S. Small Business Administration, Office of Advocacy, December 2005), table 8.1, 186, http://www.sba.gov/advo/research/sbe_05_ch08.pdf (accessed October 10, 2008). Small business owners are also particularly adept at finding new ways of doing old things. In 1994, for example, a young computer-science graduate working on Wall Street came up with the novel idea of selling books over the Internet. During the first year of operations, sales at Jeff Bezos’s new company—Amazon.com—reached half a million dollars. In less than ten years, annual sales had topped $3 billion. Not only did his innovative approach to online retailing make Bezos enormously rich, but it also established a viable model for the e-commerce industry. Why are small businesses so innovative? For one thing, they tend to offer environments that appeal to individuals with the talent to invent new products or improve the way things are done. Fast decision making is encouraged, their research programs tend to be focused, and their compensation structures typically reward top performers. According to one SBA study, the supportive environments of small firms are roughly thirteen times more innovative per employee than the less innovation-friendly environments in which large firms traditionally operate.William J. Baumol, “Small Firms: Why Market-Driven Innovation Can’t Get Along without Them” (U.S. Small Business Administration, Office of Advocacy, December 2005), http://www.sba.gov/advo/research/sbe_05_ch08.pdf (accessed October 10, 2008), 187. The success of small businesses in fostering creativity has not gone unnoticed by big businesses. In fact, many large companies have responded by downsizing to act more like small companies. Some large organizations now have separate work units whose purpose is to spark innovation. Individuals working in these units can focus their attention on creating new products that can then be developed by the company. Small business is the portal through which many people enter the economic mainstream. Business ownership allows individuals, including women and minorities, to achieve financial success, as well as pride in their accomplishments. While the majority of small businesses are still owned by white males, the past two decades have seen a substantial increase in the number of businesses owned by women and minorities. 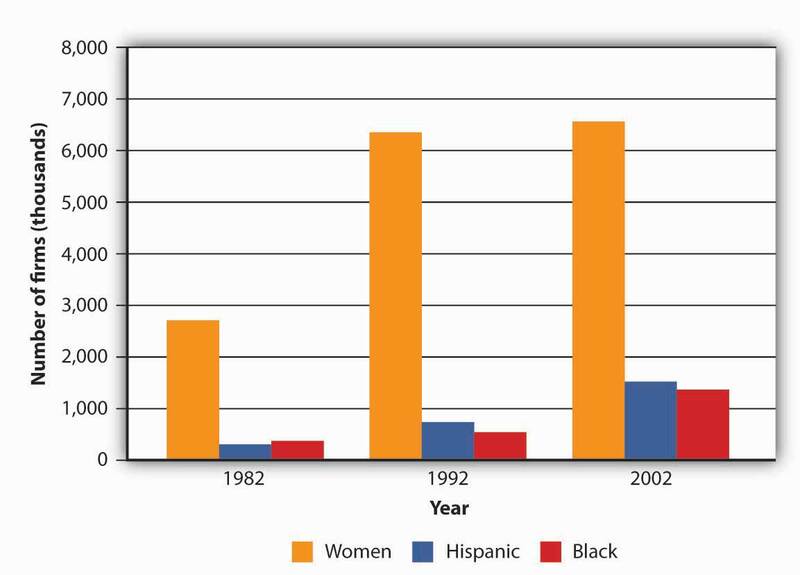 Figure 5.4 "Businesses Owned by Women and Minorities" gives you an idea of how many American businesses are owned by women and minorities, and indicates how much the numbers grew between 1982 and 2002, the last year for which there are reliable data.Ying Lowrey, “Women in Business, 2006: A Demographic Review of Women’s Business Ownership” (U.S. Small Business Administration, Office of Advocacy, August 2006), http://www.sba.gov/advo/research/rs280tot.pdf (accessed October 10, 2008); Ying Lowrey, “Minorities in Business” (U.S. Small Business Administration, Office of Advocacy, April 2007), http://www.sba.gov/advo/research/rs298tot.pdf (accessed October 10, 2008). Small firms complement large firms in a number of ways. They supply many of the components needed by big companies. For example, a substantial portion of the mind-boggling $90 billion paid annually by General Motors to parts suppliers goes to small businesses. Small firms also provide large ones with such services as accounting, legal, and insurance. Many small firms provide outsourcing services to large firms—that is, they hire themselves out to help with special projects or handle certain business functions. A large firm, for example, might hire a small one to handle its billing or collection services or to manage its health care benefits. A large company might contract with a small information technology firm to manage its Web site or oversee software upgrades. Small companies provide another valuable service to large companies by acting as sales agents for their products. For example, automobile dealerships, which are generally small businesses, sell vehicles for the big car makers. Local sporting goods stores sell athletic shoes made by industry giants, such as Adidas and Nike. Your corner deli sells products made by large companies, such as Coca-Cola and Frito-Lay. According to the SBA, a small business is independently owned and operated, exerts little influence in its industry, and (with minimal exceptions) has fewer than five hundred employees. Small businesses tend to foster environments that appeal to individuals with the talent to invent new products or improve the way things are done. They typically make faster decisions, their research programs often are focused, and their compensation structures frequently reward top performers. Small firms supply many of the components needed by big companies. They also provide large firms with such services as accounting, legal, and insurance, and many provide outsourcing services to large companies—that is, they hire themselves out to help with special projects or handle certain business functions. Small companies (such as automotive dealerships) often act as sales agents for the products of large businesses (for example, car makers). How “small” is a small business? If a substantial portion of small businesses in the United States suddenly closed, what would be the impact on the U.S. economy? How would all these closings affect workers, consumers, and other businesses? 5.3 What Industries Are Small Businesses In? Describe the goods-producing and service-producing sectors of an economy. Identify the industries in which small businesses are concentrated. If you want to start a new business, you probably should avoid certain types of businesses. You’d have a hard time, for example, setting up a new company to make automobiles or aluminum, because you’d have to make tremendous investments in property, plant, and equipment, and raise an enormous amount of capital to pay your workforce. Fortunately, plenty of opportunities are still available if you’re willing to set your sights a little lower. Many types of businesses require reasonable initial investments, and not surprisingly, these are the ones that usually present attractive small business opportunities. We’ll have more to say about industries and how to analyze them in later chapters. Here, we’ll simply define an industry as a group of companies that compete with one another to sell similar products, and we’ll focus on the relationship between a small business and the industry in which it operates. First, we’ll discuss the industries in which small businesses tend to be concentrated. To do this, we’ll divide businesses into two broad types of industries, or sectors: the goods-producing sector and the service-producing sector. The goods-producing sectorAll businesses whose primary purpose is to produce tangible goods. includes all businesses that produce tangible goods. Generally speaking, companies in this sector are involved in manufacturing, construction, and agriculture. The service-producing sectorAll businesses whose primary purpose is to provide a service rather than make tangible goods. includes all businesses that provide services but don’t make tangible goods. They may be involved in retail and wholesale trade, transportation, communications, finance, insurance, real estate, and such professional activities as health care, advertising, accounting, and personal services. About 80 percent of small businesses in the United States are concentrated in the service-producing sector. Of these, about 25 percent are in retailing, 10 percent in wholesaling, and 35 percent in professional and business services. Of the 20 percent of all small businesses in the goods-producing sector, nearly two thirds are in construction and the other one third in manufacturing.John Case, “What Businesses Are Small Companies Really In—And Where Are They Scarce,” Inc.com (May 2001), http://www.inc.com/magazine/20010515/22612.html (accessed October 11, 2008) (October 11, 2008). A high percentage of small businesses are in the retail sector. The high concentration of small businesses in the service-producing sector reflects the makeup of the overall U.S. economy. Over the past forty years, the service-producing sector has been growing at an impressive rate. In 1960, for example, the goods-producing sector accounted for 38 percent of GDP, the service-producing sector for 62 percent. By 2000, the balance had shifted dramatically, with the goods-producing sector accounting for only 23 percent of GDP, while the service-producing sector had grown to 77 percent.Laura Baughman, “Why Congress Should Fund Better Services Data,” Sitrends.org (May 6, 2002), http://www.sitrends.org/ideas/expert.asp?EXPERT_ID=49 (accessed October 11, 2008) (October 11, 2008). The largest areas of the goods-producing sector are construction and manufacturing. Construction businesses are often started by skilled workers, such as electricians, painters, plumbers, and home builders. They tend to be small and generally work on local projects. Though manufacturing is primarily the domain of large businesses, there are exceptions. BTIO/Realityworks, for example, is a manufacturing enterprise (components come from Ohio and China, and assembly is done in Wisconsin). Another small manufacturer is Reveal Entertainment, which was founded in 1996 to make and distribute board games. Founder Jeffrey Berndt started with a single award-winning game—a three-dimensional finance and real estate game called “Tripoly”—and now boasts a product line of dozens of board games. There are strategy games, like “Squad Seven,” which uses a CD soundtrack to guide players through a jungle in search of treasure; children’s games, like “Portfolio Junior,” which teaches kids the rudiments of personal finances; and party games, like “So Sue Me,” in which players get to experience the fun side of suing their neighbors and taking their possessions.Go to Reveal Entertainment at http://www.revealgames.com (accessed October 11, 2008) (October 11, 2008). Many small businesses in this sector are retailers—they buy goods from other firms and sell them to consumers, in stores, by phone, through direct mailings, or over the Internet. In fact, entrepreneurs are turning increasingly to the Internet as a venue for start-up ventures. Take Tony Roeder, for example, who had a fascination with the red Radio Flyer wagons that many of today’s adults had owned as children. In 1998, he started an online store through Yahoo! to sell red wagons from his home. In three years, he turned his online store into a million-dollar business. Internet entrepreneurship was also attractive to Sean Lundgren and Todd Livdahl—two computer engineers who gave up successful careers at Disney to turn their fascination with video games and DVDs into an online business. To their delight, their small start-up venture, a CD and DVD retailer that they call Sneetch.com, generated sales of $1.2 million during its first year of operation.Isabel Isidro, “What Works on the Web: 12 Lessons from Successful Home-Based Online Entrepreneurs,” PowerHomeBiz.com (2008), http://www.powerhomebiz.com/vol63/whatworks.htm (accessed October 12, 2008) (October 12, 2008). Other small business owners in this sector are wholesalers—they sell products to businesses that buy them for resale or for company use. A local bakery, for example, is acting as a wholesaler when it sells desserts to a restaurant, which then resells them to its customers. A small business that buys flowers from a local grower (the manufacturer) and resells them to a retail store is another example of a wholesaler. A high proportion of small businesses in this sector provide professional, business, or personal services. Doctors and dentists are part of the service industry, as are insurance agents, accountants, and lawyers. So are businesses that provide personal services, such as dry cleaning and hairdressing. David Marcks, for example, entered the service industry about fourteen years ago when he learned that his border collie enjoyed chasing geese at the golf course where he worked. Anyone who’s been on a golf course recently knows exactly what the goose problem is. While they are lovely to look at, they answer the call of nature on tees, fairways, and greens. That’s where Marcks’s company, Geese Police, comes in: Marcks employs specially trained dogs to chase the geese away. He now has twenty-seven trucks, thirty-two border collies, and five offices. Golf courses account for only about 5 percent of his business, as his dogs now patrol corporate parks and playgrounds as well.Isabel M. Isidro, “Geese Police: A Real-Life Home Business Success Story,” PowerHomeBiz.com (2008), http://www.powerhomebiz.com/OnlineSuccess/geesepolice.htm (accessed October 8, 2008). 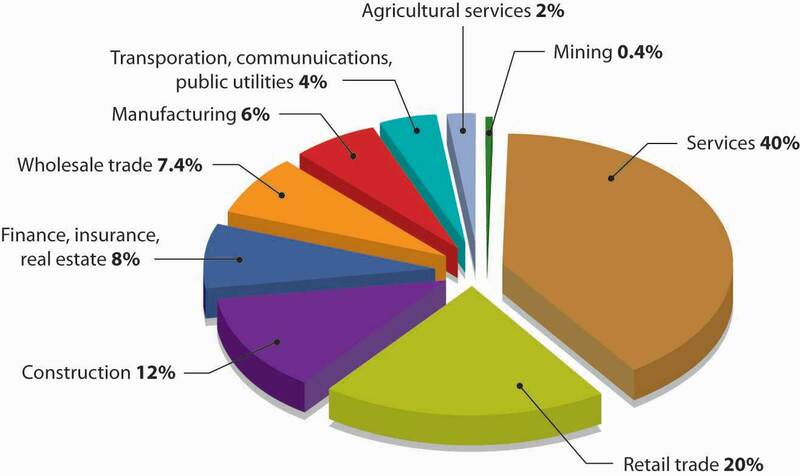 Figure 5.6 "Small Business by Industry" provides a more detailed breakdown of small businesses by industry. The goods-producing sector includes all businesses that produce tangible goods. The service-producing sector includes all businesses that provide services but don’t make tangible goods. The largest areas of the goods-producing sector are construction and manufacturing. Construction businesses are often started by skilled workers, such as electricians, painters, plumbers, and home builders. These businesses tend to be small and generally focused on local projects. Though manufacturing is primarily the domain of large businesses, there are exceptions. Many small businesses in the service-producing sector are retailers—they buy goods from other firms and resell them to consumers, in stores, by phone, through direct mailings, or over the Internet. Other small business owners in this sector are wholesalers—they sell products to businesses that buy them for resale or for company use. A high proportion of small businesses in this sector provide professional, business, or personal services. Do you want to be a business owner someday? Before deciding, you might want to consider the following advantages and disadvantages of business ownership.Small Business Development Center, “Pros and Cons of Owning a Business,” http://72.14.203.104/u/siu?q=cache:DFSPVtmg7j0J:http://www.siu.edu/sbdc/buscheck.htm+pros+and+cons+of+owning+a+business&hl=en&gl=us&ct=clnk&cd=1&ie=UTF-8 (accessed April 21, 2006). Time commitment. People often start businesses so that they’ll have more time to spend with their families. Unfortunately, running a business is extremely time-consuming. In theory, you have the freedom to take time off, but in reality, you may not be able to get away. In fact, you’ll probably have less free time than you’d have working for someone else. For many entrepreneurs and small business owners, a forty-hour workweek is a myth; see Figure 5.7 "The Entrepreneur’s Workweek". Vacations will be difficult to take and will often be interrupted. In recent years, the difficulty of getting away from the job has been compounded by cell phones, WiFi laptops, and personal digital assistants (PDAs), and many small business owners have come to regret that they’re always reachable. In spite of these and other disadvantages, most small business owners are pleased with their decision to start a business. A survey conducted by the Wall Street Journal and Cicco and Associates indicates that small business owners and top-level corporate executives agree overwhelmingly that small business owners have a more satisfying business experience. Interestingly, the researchers had fully expected to find that small business owners were happy with their choices; they were, however, surprised at the number of corporate executives who believed that the grass was greener in the world of small business ownership.Cicco and Associates Inc., “Type E Personality—Happy Days—Entrepreneurs Top Satisfaction Survey,” Entrepreneur.com, http://entrepreneur-online.com/mag/article/0,1539,226838–-3-,00.html (accessed April 21, 2006). Explain what it takes to start a business. Evaluate the advantages and disadvantages of several small business ownership options—starting a business from scratch, buying an existing business, and obtaining a franchise. Starting a business takes talent, determination, hard work, and persistence. It also requires a lot of research and planning. Before starting your business, you should appraise your strengths and weaknesses and assess your personal goals to determine whether business ownership is for you.From Kathleen Allen, “Getting Started in Entrepreneurship,” in Entrepreneurship for Dummies (New York: Wiley, 2001), 46. What, exactly, is my business idea? Is it feasible? What type of business is right for me? What industry do I want to get into? Do I want to be a manufacturer, a retailer, or a wholesaler? Do I want to provide professional or personal services? Do I want to start a business that I can operate out of my home? Do I want to run a business that’s similar to many existing businesses? Do I want to innovate—to create a new product or a new approach to doing business? Do I want to start a new business, buy an existing one, or buy a franchise? Do I want to start the business by myself or with others? What form of business organization do I want? Do I want to own the business myself, or do I want to work with other owners—say, as a partnership or a corporation? For some people, coming up with a great business idea is a gratifying adventure. For most, however, it’s a daunting task. The key to coming up with a business idea is identifying something that customers want—or, perhaps more importantly, filling an unmet need. Your business will probably survive only if its purpose is to satisfy its customers—the ultimate users of its goods or services. In coming up with a business idea, don’t ask, “What do we want to sell?” but rather, “What does the customer want to buy?”Scott Thurm and Joann S. Lublin, “Peter Drucker’s Legacy Includes Simple Advice: It’s All about the People,” Wall Street Journal (November 14, 2005, B1), http://online.wsj.com/public/article/SB113192826302796041.html?mod=2_1194_3 (accessed April 21, 2006). To come up with an innovative business idea, you need to be creative. The idea itself can come from various sources. Prior experience accounts for the bulk of new business ideas. Many people generate ideas for industries they’re already working in. Past experience in an industry also increases your chances of success. Take Sam Walton, the late founder of Wal-Mart. He began his retailing career at JCPenney and then became a successful franchiser of a Ben Franklin five-and-dime store. In 1962, he came up with the idea of opening large stores in rural areas, with low costs and heavy discounts. He founded his first Wal-Mart store in 1962, and when he died thirty years later, his family’s net worth was $25 billion.Peter Krass, “Sam Walton: 10 Rules for Building a Successful Business,” http://www.powerhomebiz.com/vol76/walton.htm (accessed April 21, 2006). Industry experience also gave Howard Schultz, a New York executive for a housewares company, his breakthrough idea. In 1981, Schultz noticed that a small customer in Seattle—Starbucks Coffee, Tea and Spice—ordered more coffeemaker cone filters than Macy’s and many other large customers. So he flew across the country to find out why. His meeting with the owner-operators of the original Starbucks Coffee Co. resulted in his becoming part-owner of the company, and changed his life and the life of coffee lovers forever. Schultz’s vision for the company far surpassed that of its other owners. While they wanted Starbucks to remain small and local, Schultz saw potential for a national business that not only sold world-class-quality coffee beans but also offered customers a European coffee-bar experience. After attempting unsuccessfully to convince his partners to try his experiment, Schultz left Starbucks and started his own chain of coffee bars, which he called Il Giornale (after an Italian newspaper). Two years later, he bought out the original owners and reclaimed the name Starbucks.Howard Schultz and Dori Jones Yang, Pour Your Heart into It (New York: Hyperion, 1997), 24–109. Other people come up with business ideas because of hobbies or personal interests. This was the case with Nike founder Phil Knight, who was an avid runner. He was convinced that it was possible to make high-quality track shoes that cost less than the European shoes dominating the market at the time. His track experience, coupled with his knowledge of business (Knight holds an MBA from Stanford and worked as an accountant), inspired him to start Nike. Michael Dell also turned a personal interest into a business. From a young age, he was obsessed with taking computers apart and putting them back together again, and it was this personal interest that led to his great business idea. At college, instead of attending classes, he spent his time assembling computers and, eventually, founded Dell Computers. We will expand on this important topic of idea generation and creativity in other chapters. As we’ve already seen, you can become a small business owner in one of three ways—by starting a new business, buying an existing one, or obtaining a franchise. Let’s look more closely at the advantages and disadvantages of each option. 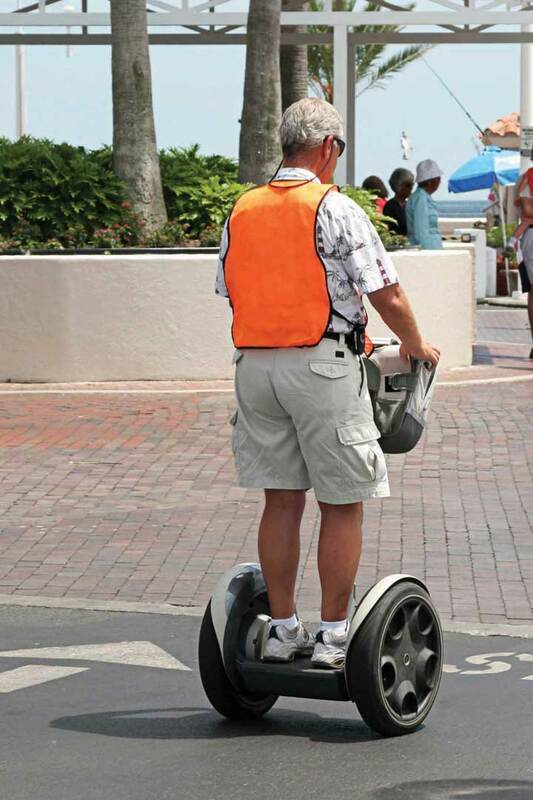 Segways have made getting around large cities quicker and easier—many now offer Segway Tours. The most common—and the riskiest—option is starting from scratch. This approach lets you start with a clean slate and allows you to build the business the way you want. You select the goods or services that you’re going to offer, secure your location, and hire your employees, and then it’s up to you to develop your customer base and build your reputation. This is the path taken by Dean Kamen when he formed a company to design and market the Segway, and also by Tom Anderson and Chris DeWolfe when they started MySpace. Of course, for every Kamen, Anderson, and DeWolfe, there are hundreds of individuals whose venture into business was unsuccessful. If you decide to buy an existing business, some things will be easier. You’ll already have a proven product, current customers, active suppliers, a known location, and trained employees. You’ll also find it much easier to predict the business’s future success. There are, of course, a few bumps in this road to business ownership. First, it’s hard to determine how much you should pay for a business. You can easily determine how much things like buildings and equipment are worth, but how much should you pay for the fact that the business already has steady customers? In addition, a business, like a used car, might have performance problems that you can’t detect without a test drive (an option, unfortunately, that you don’t get when you’re buying a business). Perhaps the current owners have disappointed customers; maybe the location isn’t as good as it used to be. You might inherit employees that you wouldn’t have hired yourself. Finally, what if the previous owners set up a competing business that draws away their former—and your current—customers? Lastly, you can buy a franchiseForm of business ownership in which a franchiser (a seller) grants a franchisee (a buyer) the right to use a brand name and to sell its products or services.. Under this setup, a franchiser (the company that sells the franchise) grants the franchisee (the buyer—you) the right to use a brand name and to sell its goods or services. Franchises market products in a variety of industries, including food, retail, hotels, travel, real estate, business services, cleaning services, and even weight-loss centers and wedding services. There are thousands of franchises, many of which are quite familiar—SUBWAY, McDonald’s, 7-Eleven, Holiday Inn, Budget Car Rental, RadioShack, and Jiffy Lube. 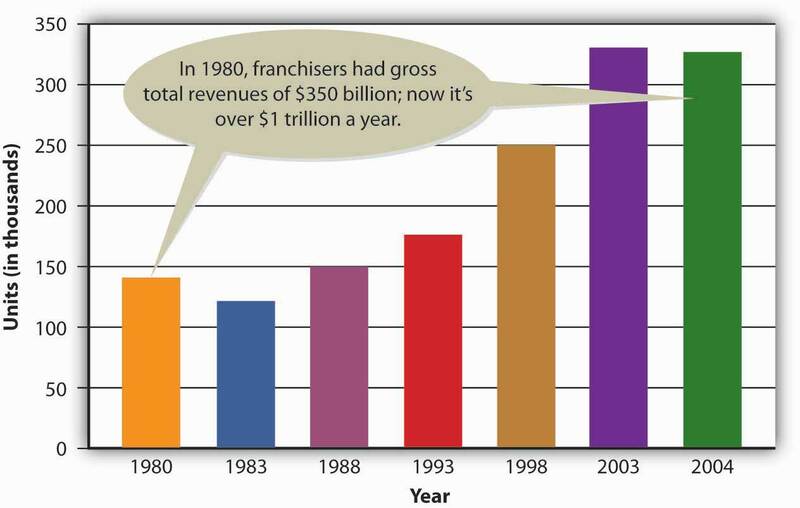 As you can see from Figure 5.9 "The Growth of Franchising, 1980–2004", franchising has become an extremely popular way to do business. A new franchise outlet opens once every eight minutes in the United States, where one in twelve businesses is now a franchise. Franchises employ eight million people and account for 40 percent of all retail sales in this country.“Franchise 500,” Entrepreneur.com—Franchise, http://www.entrepreneur.com/franchises/rankings/franchise500-115608/2005,-1.html (accessed April 21, 2006). In addition to the right to use a company’s brand name and sell its products, the franchisee gets help in picking a location, starting and operating the business, and advertising. In effect, you’ve bought a prepackaged, ready-to-go business that’s proven successful elsewhere. You also get ongoing support from the franchiser, which has a vested interest in your success. Not surprisingly, these advantages don’t come cheaply. Franchises can be very expensive, usually depending on the amount of business that a franchisee is expected to do. KFC franchises, for example, require a total investment of $1.1 million to $1.7 million each. This fee includes the cost of the property, equipment, training, start-up costs, and the franchise fee—a one-time charge for the right to operate as a KFC outlet. McDonald’s is in the same price range ($950,000 to $1.8 million). SUBWAY sandwich shops are more affordable, with expected total investment ranging from $80,000 to $310,000. If you’d prefer teaching dance and exercise classes, you could get a Jazzercise franchise for anywhere from $3,000 to $33,000. If you don’t want to deal in food or dance, you might want to buy a dating service. The Right One® franchises go for an initial investment of $100,000 to $250,000, depending on location.“2008 Franchise 500,” Entrepreneur.com (2008), http://www.entrepreneur.com/franchise500 (accessed October 18, 2008). In addition to your initial investment, you’ll have to pay two other fees on a monthly basis—a royalty fee (typically from 3 to 12 percent of sales) for continued support from the franchiser and the right to keep using the company’s trade name, plus an advertising fee to cover your share of national and regional advertising. You’ll also be expected to buy your products from the franchiser.Michael Seid and Kay Marie Ainsley, “Franchise Fee—Made Simple,” Entrepreneur.com, http://www.entrepreneur.com/article/0,4621,299085,00.html (accessed April 21, 2006). Why do would-be business owners like franchises? For one thing, buying a franchise lets you start up under fairly safe conditions, with a proven model for running a company and a permanent support team. You can profit from name recognition without having to develop your own image in the marketplace, and you can be your own boss (as long as you comply with the standards set by the franchiser). But there are disadvantages. The cost of obtaining and running a franchise can be high, and you have to play by the franchiser’s rules, even when you disagree with them. The franchiser maintains a great deal of control over its franchisees. For example, if you own a fast-food franchise, the franchise agreement will likely dictate the food and beverages you can sell; the methods used to store, prepare, and serve the food; and the prices you’ll charge. In addition, the agreement will dictate what the premises will look like and how they’ll be maintained. Finally, franchisers don’t always keep their promises. What do you do if the promised advertising or employee training doesn’t materialize? What do you do if you’re forced to make unnecessary and costly alterations to your premises, or the franchising company sets up a competing establishment nearby? What if the franchising company gets bad press, which, in turn, hurts your sales? You always have the option of suing the franchiser, but this is time-consuming and costly. As with any business venture, you need to do your homework before investing in a franchise. What type of business is right for me? What industry do I want to get into? Do I want to run a business that’s similar to many existing businesses, or do I want to innovate? Do I want to start a new business, take over an existing one, or buy a franchise? Do I want to start the business by myself, or do I want company? What form of business organization do I want? After you’ve addressed these basic questions, you’ll be ready to describe your future business in the form of a business plan—a document that identifies the goals of your proposed business and explains how it will achieve them. Before you actually start up your business, you must also get financing. The key to coming up with a business idea is identifying something that customers want. Your business will probably survive only if its “purpose” is to satisfy its customers—the ultimate users of its goods or services. Starting from scratch. This is the most common—and riskiest—option. Advantage: You start with a clean slate and build the business the way you want. Disadvantage: It’s up to you to develop your customer base and build your reputation. Buying an existing business. This option is not as risky as starting a business from scratch, but it has some drawbacks. Advantages: You’ll already have a proven product, current customers, active suppliers, a known location, and trained employees. Disadvantages: It’s hard to determine how much to pay for a business; perhaps the current owners have disappointed customers; maybe the location isn’t as good as it used to be. Buying a franchise. Under a franchise setup, a franchiser (the company that sells the franchise) grants the franchisee (the buyer) the right to use a brand name and to sell its goods or services. Advantages: You’ve bought a prepackaged, ready-to-go business that’s proven successful elsewhere; you also get ongoing support from the franchiser. Disadvantages: The cost can be high; you have to play by the franchiser’s rules; and franchisers don’t always keep their promises. If business ownership interests you, you can start a new business, buy an existing one, or obtain a franchise. Evaluate the advantages and disadvantages of each option. Which option do you find most appealing, and why? Describe the business you would probably start. What is the company’s business model? What does it do? Where does it do it? Are you the kind of person the company wants to attract as a franchise partner? How much would it cost you to buy a franchise? How much total capital would you need? What kinds of support and services would you receive from the company? Assuming that you had enough money, would you buy a franchise? Why, or why not? As a reward for working hard, take a break and click on the Junk Genie icon on the bottom of the company’s home page (http://www.1800gotjunk.com). Can you figure out the trick? Pass it along to your friends. Discuss the importance of planning for your business, and identify the key sections of a business plan. If you want to start a business, you must prepare a business plan. This essential document should tell the story of your business concept, provide an overview of the industry in which you will operate, describe the goods or services you will provide, identify your customers and proposed marketing activities, explain the qualifications of your management team, and state your projected income and borrowing needs. The business plan is a plan or blueprint for the company, and it’s an indispensable tool in attracting investors, obtaining loans, or both. Remember, too, that the value of your business plan isn’t limited to the planning stages of your business and the process of finding start-up money. Once you’ve acquired start-up capital, don’t just stuff your plan in a drawer. Treat it as an ongoing guide to your business and its operations, as well as a yardstick by which you can measure your performance. Keep it handy, update it periodically, and use it to assess your progress. In developing and writing your business plan, you must make strategic decisions in the areas of management, operations, marketing, accounting, and finance—in short, in all the functional areas of business that we described in Chapter 1 "The Foundations of Business". Granted, preparing a business plan takes a lot of time and work, but it’s well worth the effort. A business plan forces you to think critically about your proposed business and reduces your risk of failure. It forces you to analyze your business concept and the industry in which you’ll be operating, and it helps you determine how you can grab a percentage of sales in that industry. The most common use of a business plan is persuading investors, lenders, or both, to provide financing. These two groups look for different things. Investors are particularly interested in the quality of your business concept and the ability of management to make your venture successful. Bankers and other lenders are primarily concerned with your company’s ability to generate cash to repay loans. To persuade investors and lenders to support your business, you need a professional, well-written business plan that paints a clear picture of your proposed business. The executive summaryOverview emphasizing the key points of a business plan to get the reader excited about the business’s prospects. is a one- to three-page overview of the business plan. It’s actually the most important part of the business plan: it’s what the reader looks at first, and if it doesn’t capture the reader’s attention, it might be the only thing that he or she looks at. It should therefore emphasize the key points of the plan and get the reader excited about the prospects of the business. Even though the executive summary is the first thing read, it’s written after the other sections of the plan are completed. An effective approach in writing the executive summary is to paraphrase key sentences from each section of the business plan. This process will ensure that the key information of each section is included in the executive summary. What will your proposed company do? Will it be a manufacturer, a retailer, or a service provider? What goods or services will it provide? Why are your goods or services unique? How will your goods or services be sold? Because later parts of the plan will provide more detailed discussions of many of these issues, this section should provide only an overview of these topics. How large is the industry? What are total sales for the industry, in volume and dollars? Is the industry mature or are new companies successfully entering it? What opportunities exist in the industry? What threats exist? What factors will influence future expansion or contraction of the industry? What is the overall outlook for the industry? Who are your major competitors in the industry? How does your product differ from those of your competitors? This portion of the business plan states the company’s mission statement and core values. The mission statementStatement describing an organization’s purpose or mission—its reason for existence—and telling stakeholders what the organization is committed to doing. describes the purpose or mission of your organization—its reason for existence. It tells the reader what the organization is committed to doing. For example, one mission statement reads, “The mission of Southwest Airlines is dedication to the highest quality of customer service delivered with a sense of warmth, friendliness, individual pride, and company spirit.”Southwest Airline’s company Web site, about SWA section, http://www.southwest.com/about_swa/mission.html (accessed October 30, 2008). Core valuesStatement of fundamental beliefs describing what’s appropriate and important in conducting organizational activities and providing a guide for the behavior of organization members. are fundamental beliefs about what’s important and what is (and isn’t) appropriate in conducting company activities. Core values are not about profits, but rather about ideals. They should help guide the behavior of individuals in the organization. Coca-Cola, for example, intends that its core values—honesty, integrity, diversity, quality, respect, responsibility, and accountability—will let employees know what behaviors are (and aren’t) acceptable. Management makes the key decisions for the business, such as its legal form and organizational structure. This section of the business plan should outline these decisions and provide information about the qualifications of the key management personnel. This section dentifies the chosen legal form of business ownership: sole proprietorship (personal ownership), partnership (ownership shared with one or more partners), or corporation (ownership through shares of stock). It isn’t enough merely to have a good business idea: you need a talented management team that can turn your concept into a profitable venture. This part of the management plan section provides information about the qualifications of each member of the management team. Its purpose is to convince the reader that the company will be run by experienced, well-qualified managers. It describes each individual’s education, experience, and expertise, as well as each person’s responsibilities. It also indicates the estimated annual salary to be paid to each member of the management team. This section of the management plan describes the relationships among individuals within the company, listing the major responsibilities of each member of the management team. To succeed in attracting investors and lenders, you must be able to describe your goods or services clearly (and enthusiastically). Here, you describe all the goods and services that you will provide the marketplace. This section explains why your proposed offerings are better than those of competitors and indicates what market needs will be met by your goods or services. In other words, it addresses a key question: What competitive advantage will the company’s goods and services have over similar products on the market? This section also indicates how you plan to obtain or make your products. Naturally, the write-up will vary, depending on whether you’re proposing a service company, a retailer, or a manufacturer. If it’s a service company, describe the process by which you’ll deliver your services. If it’s a retail company, tell the reader where you’ll purchase products for resale. How will products be designed? What technology will be needed to design and manufacture products? Will the company run its own production facilities, or will its products be manufactured by someone else? Where will production facilities be located? What are the design and layout of the facilities? How many workers will be employed in the production process? How many units will be produced? How will the company ensure that products are of high quality? Target market. Describe future customers and profile them according to age, gender, income, interests, and so forth. If your company will sell to other companies, describe your typical business customer. Pricing. State the proposed price for each product. Compare your pricing strategy to that of competitors. Distribution. Explain how your goods or services will be distributed to customers. Indicate whether they’ll be sold directly to customers or through retail outlets. Promotion. Explain your promotion strategy, indicating what types of advertising you’ll be using. Will your company have a Web site? Who will visit the site? What will the site look like? What information will it supply? Will you sell products over the Internet? How will you attract customers to your site and entice them to buy from your company? In this section, indicate whether you’ll be involved in international markets, by either buying or selling in other countries. If you’re going to operate across borders, identify the challenges that you’ll face in your global environment and explain how you’ll meet them. If you don’t plan initially to be involved in international markets, state what strategies, if any, you’ll use to move into international markets when the time comes. In preparing the financial section of your business plan, specify the company’s cash needs and explain how you’ll be able to repay debt. This information is vital in obtaining financing. It reports the amount of cash needed by the company for start-up and initial operations and provides an overview of proposed funding sources. It presents financial projections, including expected sales, costs, and profits (or losses). It refers to a set of financial statements included in an appendix to the business plan. Here, you furnish supplemental information that may be of interest to the reader. In addition to a set of financial statements, for example, you might attach the résumés of your management team. A business plan tells the story of your business concept, provides an overview of the industry in which you will operate, describes the goods or services you will provide, identifies your customers and proposed marketing activities, explains the qualifications of your management team, and states your projected income and borrowing needs. In your business plan, you make strategic decisions in the areas of management, operations, marketing, accounting, and finance. Developing your business plan forces you to analyze your business concept and the industry in which you’ll be operating. Its most common use is persuading investors and lenders to provide financing. Executive summary. One- to three-page overview. Description of proposed business. Brief description of the company that answers such questions as what your proposed company will do, what goods or services it will provide, and who its main customers will be. Industry analysis. Short introduction to the industry in which you propose to operate. Mission statement and core values. Declaration of your mission statement, which are fundamental beliefs about what’s important and what is (and isn’t) appropriate in conducting company activities. Management plan. Information about management team qualifications and responsibilities, and designation of your proposed legal form of organization. Goods, services, and the production process. Description of the goods and services that you’ll provide in the marketplace; explanation of how you plan to obtain or make your products or of the process by which you’ll deliver your services. Marketing. Description of your plans in four marketing-related areas: target market, pricing, distribution, and promotion. Global issues. Description of your involvement, if any, in international markets. Financial plan. Report on the cash you’ll need for start-up and initial operations, proposed funding sources, and means of repaying your debt. Appendices. Supplemental information that may be of interest to the reader. You’ll bake the cookies in the kitchen of a friend’s apartment. You’ll charge $1 each or $10 a dozen. Your purpose is to make the best cookies on campus and deliver them fresh. You value integrity, consideration of others, and quality. Each cookie will have ten chocolate chips and will be superior to those sold in nearby bakeries and other stores. You expect sales of $6,000 for the first year. Chocolate chip cookies are irresistible to college students. There’s a lot of competition from local bakeries, but your cookies will be superior and popular with college students. You’ll make them close to campus using only fresh ingredients and sell them for $1 each. Your management team is excellent. You expect first-year sales of $6,000 and net income of $1,500. You estimate start-up costs at $600. You’ll place ads for your product in the college newspaper. You’ll hire a vice president at a salary of $100 a week. You can ship cookies anywhere in the United States and in Canada. You need $600 in cash to start the business. There are six bakeries within walking distance of the college. You’ll bake nothing but cookies and sell them to college students. You’ll make them in an apartment near campus and deliver them fresh. Discuss ways to succeed in managing a business, and explain why some businesses fail. Identify sources of small business assistance from the Small Business Administration. Know your business. It seems obvious, but it’s worth mentioning: successful businesspeople know what they’re doing. They’re knowledgeable about the industry in which they operate (both as it stands today and where it’s headed), and they know who their competitors are. They know how to attract customers and who the best suppliers and distributors are, and they understand the impact of technology on their business. Know the basics of business management. You might be able to start a business on the basis of a great idea, but to manage it you need to understand the functional areas of business—accounting, finance, management, marketing, and production. You need to be a salesperson, as well as a decision maker and a planner. Have the proper attitude. When you own a business, you are the business. If you’re going to devote the time and energy needed to transform an idea into a successful venture, you need to have a passion for your work. You should believe in what you’re doing and make a strong personal commitment to your business. Get adequate funding. It takes a lot of money to start a business and guide it through the start-up phase (which can last for over a year). You can have the most brilliant idea in the world, the best marketing approach, and a talented management team, yet if you run out of cash, your career as a business owner could be brief. Plan for the long term and work with lenders and investors to ensure that you’ll have sufficient funds to get open, stay open during the start-up phase, and, ultimately, expand. Manage your money effectively. You’ll be under constant pressure to come up with the money to meet payroll and pay your other bills. That’s why you need to keep an eye on cash flow—money coming in and money going out. You need to control costs and collect money that’s owed you, and, generally, you need to know how to gather the financial information that you require to run your business. Manage your time efficiently. A new business owner can expect to work sixty hours a week. If you want to grow a business and have some type of nonwork life at the same time, you’ll have to give up some control—to let others take over some of the work. Thus, you must develop time-management skills and learn how to delegate responsibility. Know how to manage people. Hiring, keeping, and managing good people are crucial to business success. As your business grows, you’ll depend more on your employees. You need to develop a positive working relationship with them, train them properly, and motivate them to provide quality goods or services. Satisfy your customers. You might attract customers through impressive advertising campaigns, but you’ll keep them only by providing quality goods or services. Commit yourself to satisfying—or even exceeding—customer needs. If you’ve paid attention to the occupancy of shopping malls over a few years, you’ve noticed that retailers come and go with surprising frequency. The same thing happens with restaurants—indeed, with all kinds of businesses. By definition, starting a business—small or large—is risky, and though many businesses succeed, a large proportion of them don’t. One-third of small businesses that have employees go out of business within the first two years. Some 55 percent never celebrate a fourth anniversary.Amy E. Knaup, “Survival and Longevity in the Business Employment Dynamics Data,” Monthly Labor Review (May 2005): 50–56, http://www.bls.gov/opub/mlr/2005/05/ressum.pdf (accessed October 20, 2008). Bad business idea. Like any idea, a business idea can be flawed, either in the conception or in the execution. If you tried selling snowblowers in Hawaii, you could count on little competition, but you’d still be doomed to failure. Cash problems. Too many new businesses are underfunded. The owner borrows enough money to set up the business but doesn’t have enough extra cash to operate during the start-up phase, when very little money is coming in but a lot is going out. Managerial inexperience or incompetence. Many new business owners have no experience in running a business; many have limited management skills. Maybe an owner knows how to make or market a product but doesn’t know how to manage people. Maybe an owner can’t attract and keep talented employees. Maybe an owner has poor leadership skills and isn’t willing to plan ahead. Lack of customer focus. A major advantage of a small business is the ability to provide special attention to customers. But some small businesses fail to seize this advantage. Perhaps the owner doesn’t anticipate customers’ needs or keep up with changing markets or the customer-focused practices of competitors. Inability to handle growth. You’d think that a sales increase would be a good thing. Often it is, of course, but sometimes it can be a major problem. When a company grows, the owner’s role changes. He or she needs to delegate work to others and build a business structure that can handle the increase in volume. Some owners don’t make the transition and find themselves overwhelmed. Things don’t get done, customers become unhappy, and expansion actually damages the company. The Small Business Administration offers an array of programs to help current and prospective small business owners. Services include assistance in developing a business plan, starting a business, obtaining financing, and managing an organization.U.S. Small Business Administration, “Expand Your Business with Programs and Services,” Services, http://www.sba.gov/services/index.html (accessed October 20, 2008). Through various programs, for example, the SBA is responsible for seeing that small business owners get more than $60 billion a year in financing from lenders and investors. Each year, the SBA 7(a) Loan Guarantee Program helps some forty-three thousand small businesspeople receive loans from private lenders. 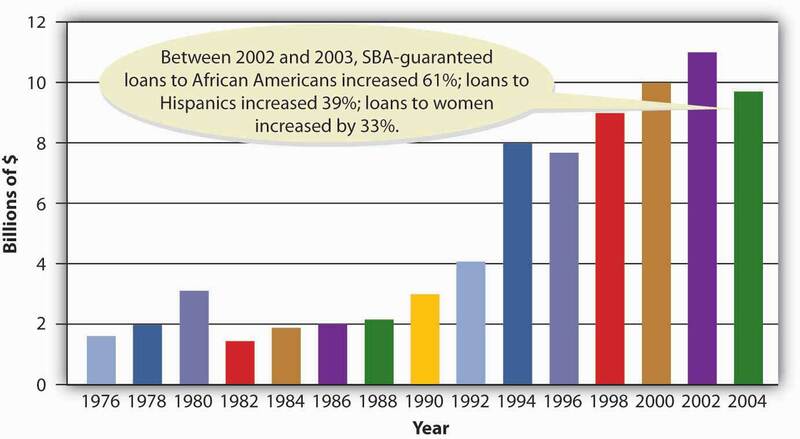 As you can see from Figure 5.10 "SBA Loan Guarantees, 1976–2004", the amount of money guaranteed by the program has risen considerably in the last thirty years.See Norman M. Scarborough and Thomas W. Zimmerman, Effective Small Business Management, 9th ed. (Upper Saddle River, NJ: Pearson Prentice Hall, 2006), 485–87; U.S. Small Business Administration, “Basic 7(a) Loan Program,” Services, http://www.sba.gov/services/financialassistance/sbaloantopics/7a/index.html (accessed October 20, 2008). The SBA also offers management and technical-services training. This assistance is available through a number of channels, including the SBA’s extensive Web site, online courses, and training programs. A full array of individualized services is also available. The Small Business Development Center (SBDC), a program of the SBASBA program in which centers housed at colleges and other locations provide free training and technical information to current and prospective small business owners., assists current and prospective small business owners with business problems and provides free training and technical information on all aspects of small business management. These services are available at approximately one thousand locations around the country, many housed at colleges and universities.U.S. Small Business Administration, “Office of Small Business Development Centers: Entrepreneurial Development,” Services, http://www.sba.gov/aboutsba/sbaprograms/sbdc/index.html (accessed October 20, 2008). If you need individualized advice from experienced executives, you can get it through the Service Corps of Retired Executives (SCORE)SBA program in which a businessperson needing advice is matched with a member of a team of retired executives working as volunteers.. Under the SCORE program, a businessperson needing advice is matched with someone on a team of retired executives who work as volunteers. Together, the SBDC and SCORE help more than nine hundred thousand small businesspersons every year.U.S. Small Business Administration, SCORE—Counselors to America’s Small Businesses, http://www.score.org/index.html (accessed October 20, 2008). Know your business. Successful businesspeople are knowledgeable about the industry in which they operate, and they know who their competitors are. Know the basics of business management. To manage a business, you need to understand the functional areas of business—accounting, finance, management, marketing, and production. Have the proper attitude. You should believe in what you’re doing and make a strong personal commitment to it. Get adequate funding. Plan for the long term and work with lenders and investors to ensure that you’ll have sufficient funds to get open, stay open during the start-up phase, and, ultimately, expand. Manage your money effectively. You need to pay attention to cash flow—money coming in and money going out—and you need to know how to gather the financial information that you require to run your business. Manage your time efficiently. You must develop time-management skills and learn how to delegate responsibility. Know how to manage people. You need to develop a positive working relationship with your employees, train them properly, and motivate them to provide quality goods or services. Satisfy your customers. Commit yourself to satisfying—or even exceeding—customer needs. Know how to compete. Find your niche in the marketplace, keep an eye on your competitors, and be prepared to react to changes in your business environment. Bad business idea. Like any idea, a business idea can be flawed, either in the conception or in the execution. Cash problems. Too many new businesses are underfunded. Managerial inexperience or incompetence. Many new business owners have no experience in running a business, and many have limited management skills. Lack of customer focus. Some owners fail to make the most of a small business’s advantage in providing special attention to customers. Inability to handle growth. When a company grows, some owners fail to delegate work or to build an organizational structure that can handle increases in volume. Services available to current and prospective small business owners from the SBA include assistance in developing a business plan, starting a business, obtaining financing, and managing an organization. The SBA is responsible for seeing that small business owners get more than $60 billion a year in financing from lenders and investors. The SBDC matches businesspeople needing advice with teams of retired executives who work as volunteers. It’s the same old story: you want to start a small business but don’t have much money. Go to http://entrepreneurs.about.com/cs/businessideas/a/10startupideas.htm and read the article titled “Business Ideas on a Budget.” Identify a few businesses that you can start for $20 or less (that’s right—$20 or less). Select one of these business opportunities that interests you. Why did you select this business? Why does the idea interest you? What would you do to ensure that the business was a success? If you needed assistance starting up or operating your business, where could you find help, and what type of assistance would be available? Why do some businesses succeed while others fail? Identify three factors that you believe to be the most critical to business success. Why did you select these factors? Identify three factors that you believe to be primarily responsible for business failures, and indicate why you selected these factors. Would You Like to Own a Sub Shop? How would you like to own your own sandwich shop? You could start one on your own or buy one that’s already in business, but an easier way might be buying a franchise from SUBWAY, the largest fast-food franchise in the world (even bigger than McDonald’s). SUBWAY began in 1965 when seventeen-year-old Fred DeLuca opened a tiny sandwich shop in Bridgeport, Connecticut, hoping to put himself through college. As it turns out, his venture paid off in more ways than one. By 1974, DeLuca was franchising his business concept, and today, there are more than fifteen thousand SUBWAY franchisees in some seventy-five countries. What do you have to do to get a SUBWAY franchise? How much would it cost to open a SUBWAY shop? What training and support would you receive from SUBWAY? What advantages do you see in buying a SUBWAY franchise rather than starting a business from scratch? What disadvantages do you see? Describe the company that he or she founded. Explain the reasons why he or she became an entrepreneur. Explain what qualities, background, or both, prepared the individual to start a business. What aspects of being an entrepreneur are particularly rewarding? What’s the downside of being an entrepreneur? What challenges do entrepreneurs face? Is entrepreneurship for you? Why, or why not? You and some fellow classmates are sitting around over pizza one night when someone comes up with an idea for a business. All of you have old term papers and essays lying around, and a couple of you know how to set up a Web page. What if you combine these two assets and start a business selling term papers over the Internet? Over time, you could collect or buy additional inventory from other students, and since some of you are good at research and others are good writers, you could even offer “student clients” the option of customized papers researched and written just for them. You figure that you can charge $15 for an “off-the-rack” paper, and for customized jobs, $10 per double-spaced page seems reasonable. You all agree that the idea is promising, and you and a partner volunteer to put together a business plan. You have no difficulty with the section describing your proposed business: you know what your business will do, what products it will offer, who your customers will be, how your products will be sold, and where you’ll be located. So far, so good. Does selling term papers over the Internet make business sense? Is it a good business idea? Could the venture be profitable? Let’s continue and find out how the business plan proceeds. Now you’re ready to write your section on industry analysis and the first question you need to answer is, Who are the players in the industry? To get some answers, you go online, log on to Google, and enter the search term “term papers for sale.” Much to your surprise, up pop dozens of links to companies that have beaten you to market. The first company you investigate claims to have a quarter-million papers in stock, plus a team of graduate students on hand to write papers for anyone needing specialized work. You realize now that you’re facing not only stiff competition but an issue that, so far, you and your partners have preferred to ignore: Is the business that you have in mind even ethical? It occurs to you that you could probably find the answer to this question in at least one of the 8,484 term papers on ethics available on your competitor’s Web site, but you decide that it would be more efficient to give the question some thought on your own. Is the sole purpose of running a business to make a profit, or do you need to be concerned about what your products will be used for? Explain your reasoning. Do you need to consider the ethics of what other people do with your product? Explain your reasoning. Knowing how to be an effective team member is a vital lifetime skill. It will help you in your academic career, in the business world, and in nonwork activities as well. It takes time and effort to learn how to work in a team. Part of the challenge is learning how to adjust your behavior to the needs of the group. Another part is learning how to motivate members of a group. A well-functioning team allows members to combine knowledge and skills, and this reliance on diverse backgrounds and strengths often results in team decisions that are superior to those made by individuals working alone. As a first step, you should do a self-assessment to evaluate whether you possess characteristics that will help you be a successful team member. You can do this by taking a “Team Player” quiz available at the Monster.com Web site. Go to http://content.monster.ie/tools/quizzes/teamplayer to link to this quiz. You’ll get feedback that helps you identify the characteristics you need to work on if you want to improve your teamwork skills. When Chris DeWolfe and Tom Anderson founded MySpace in July 2003, they had no idea that they were headed for an overnight success, but two and one-half years after they set out on their entrepreneurial adventure (which, admittedly, isn’t actually overnight), MySpace had nearly fifty million users in the United States. One in ten ads viewed on the Internet was seen on the MySpace site. Its popularity caught the attention of news and entertainment mogul Rupert Murdoch, whose News Corporation dished out $580 million for MySpace while allowing its founders to stay on as CEO and president. Why do you think MySpace has been so successful in the United States? Cite some of the challenges that it still faces in this country. If you were in charge of global expansion at MySpace, which country would you enter next? Why do you think the MySpace business concept will succeed in this country? What challenges will the company face there? What country would you avoid? Why is it incompatible with the MySpace business concept?